A maze is a tour puzzle in the form of a complex branching passage through which the solver must find a route. The pathways and walls in a maze are fixed, and puzzles in which the walls and paths can change during the game are categorized as tour puzzles. The Cretan labyrinth is the oldest known maze. 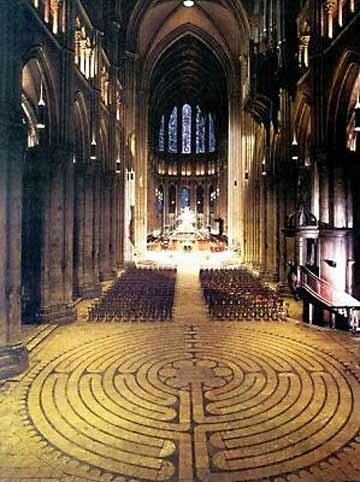 Technically the maze is distinguished from the labyrinth, which has a single through-route with twists and turns but without branches, and is not designed to be as difficult to navigate. 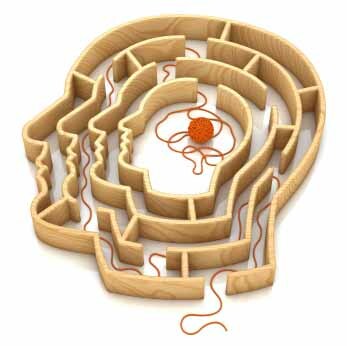 In every day speech, both maze and labyrinth denote a complex and confusing series of pathways. 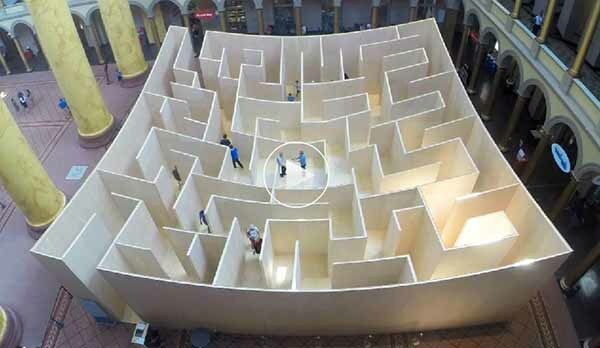 Mazes are often used in psychology experiments to study spatial navigation and learning. Such experiments typically use rats or mice. Mazes have been built with walls and rooms, with hedges, turf, corn stalks, hay bales, books, paving stones of contrasting colors or designs, and brick,or in fields of crops such as corn or, indeed, maize. Maize mazes can be very large; they are usually only kept for one growing season, so they can be different every year, and are promoted as seasonal tourist attractions. Indoors, Mirror Mazes are another form of maze, in which many of the apparent pathways are imaginary routes seen through multiple reflections in mirrors. Another type of maze consists of a set of rooms linked by doors (so a passageway is just another room in this definition). Players enter at one spot, and exit at another, or the idea may be to reach a certain spot in the maze. 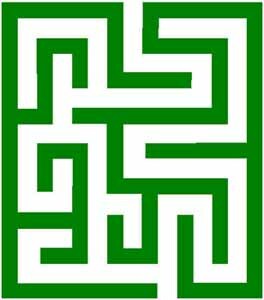 Mazes can also be printed or drawn on paper to be followed by a pencil or fingertip. Maze generation is the act of designing the layout of passages and walls within a maze. There are many different approaches to generating mazes, with various maze generation algorithms for building them, either by hand or automatically by computer. There are two main mechanisms used to generate mazes. In "carving passages", one marks out the network of available routes. In building a maze by "adding walls", one lays out a set of obstructions within an open area. Most mazes drawn on paper are done by drawing the walls, with the spaces in between the markings composing the passages. Maze solving is the act of finding a route through the maze from the start to finish. Some maze solving methods are designed to be used inside the maze by a traveler with no prior knowledge of the maze, whereas others are designed to be used by a person or computer program that can see the whole maze at once. The mathematician Leonhard Euler was one of the first to analyze plane mazes mathematically, and in doing so made the first significant contributions to the branch of mathematics known as topology. 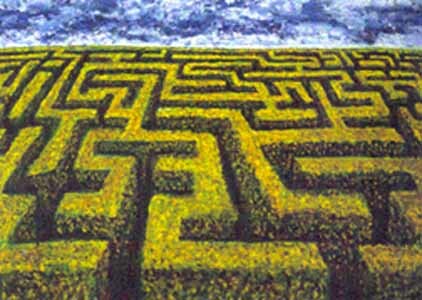 From the twists and turns of the labyrinth in the Greek myth of Theseus and the Minotaur, to the treacherous network of hedges in Stanley Kubrick's The Shining, mazes have an unmistakable and mysterious allure. But mazes - a complex network of passages through which one has to find a way - have a life beyond the plot lines of ancient myth. They exist in scientific laboratories and even, it can be said, in the form of our route home from work.